The 2016 Camp and Ride/Charity event is officially on. The weekend event started by dcstrom and Romney Cycles back in 2012 is happening again. 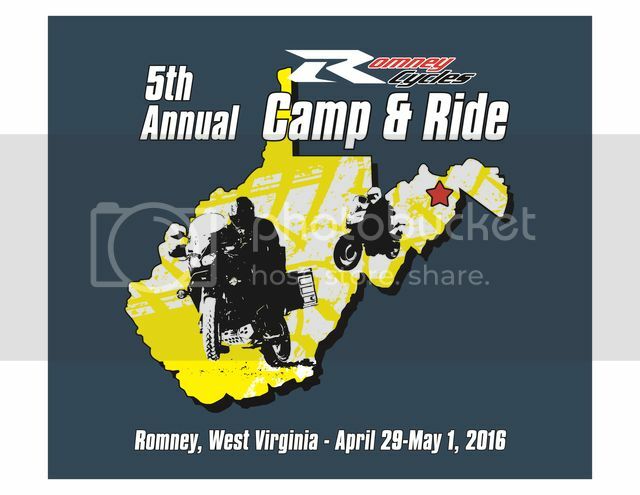 The date has been confirmed and they will be holding the “5th Annual Camp N Ride” April 29 - May 1, 2016. In 2014 Romney added a charity component to the event. In the last two years our group has raised more than $4,300 for the WV School for the Deaf and Blind. Romney has selected the school again for 2016. It's a school that really cares about the kids and puts the money directly towards helping the kids. Let's plan another huge year for the kids! If you were one of the 160+ riders that joined us last year you already know the guys at Romney go out of their way to make us feel welcome. They remain interested in growing their involvement in the Adventure market and are once again looking forward to hosting the event again in 2016. Romney has recognized that as this event grows there are more people are coming from greater distances. For the people who want more time to take advantage of the fantastic roads in the area Romney is happy to have people arrive on Thursday, April 28. Do be aware that they are still in normal dealer operation mode on Thursday, so not all weekend amenities will be in operation. Meaning port-a-potties will be there, but showers may not be operational until Friday. For everyone else the usual schedule has been most everyone arrives at some point during the day or evening that Friday. Saturday is ride day, and everyone headed their own way on Sunday. The dealership provides the camping area in a nice field next to the dealership, portable toilets, showers, water, ice, a coffee maker for the morning, plenty of wood for the fire each evening, and they sponsor the meal on Saturday evening. They also worked out a group rate at one of the local motels. Romney has been busy trying to expand the food options available on site. At least one new food vendor has been identified, but they are willing to consider more. If you know of a good food vendor that might be interested in joining us for the weekend have them call Larry at Romney to discuss the details. Romney will once again be sponsoring the dinner on Saturday evening. I know we sold out the Koolwink last year. I know we had a good number of riders at the South Branch as well. Never heard any complaints about either place. This year Microtel Inn & Suites in Keyser, WV has also offered a special rate for anyone attending a Romney special event. Keyser is about 30 minutes away. As far as Saturday rides, it's open. Talking around the fire Friday evening was how most people hooked up with who they would ride with on Saturday. Attendance at this event has grown in a big way every year, with last year having over 160 riders signed in. It's probably reasonable to anticipate the event will grow again in 2016. If you think you have some good ideas of what would be a nice ride and you are willing to take some people with you, please do. In 2015 we found the newly implemented "In Case Of Emergency" (ICE) document and sign in procedure to be very useful. Let's face it, who is going to predict a tree falling on a rider? The sign in, wrist band, ICE process will be back in 2016. 2016 will also mark the first year we put out the call for volunteers to help keep the event running smoothly. Romney always wants to do things in a first class manner. They have realized the do not have enough employees to both run the business, and provide the necessary support to a group our size. For us to continue to grow and operate smoothly we will need some of our own group to assist in making it happen. Specific details need to be worked out on how to make smart use of the volunteers. All I can say right now is volunteers will receive a special event hat and shirt to help identify them as someone who is there to help. Yamaha has confirmed they will be sending the factory tractor trailer to the event this year. So we will have both Suzuki and Yamaha on site this year. For those not interested in camping, it's never too early to book at either of the two main hotels in town, or to look into AirBnB. Got you. To avoid double counting I try to count people on only one of the three boards. I have you here so don't think I'm ignoring you over on ADV. I'm in. Trying to convince the wife to go too and find a baby sitter for the weekend. I've always thought it would be fun to ride out from CA and see what all the fuss is about. Maybe 2016 will be the year. I'll stay in touch. Sorry, your participation is not optional. Work it out. I have got the time off............April 22 to May 10. Do I need to take a few more days? Depends on how long you take to get here and home. Not for the event though. Looks like I might be able to make this one. ^^^^^ I can smell Adventure. see the Smithsonian Air & Space Museum Udvar-Hazy Center. You will not be disappointed. If you like airplanes it's pretty much the Holy Grail. If those two crazies can make it, I will definitely try. Yep, it's another solid day of annual leave. I'll supply the Scotch Bob..
Good cause you drink better stuff than I do.